Here's how to navigate the numerous options available for a dramatic career shift. A life-transforming career shift is bold, challenging, complex, scary — and ultimately (knock on wood) wonderful. For a financial advisor breaking away from the shelter of a wirehouse, such change is seismic. Happily, this transition has never been easier thanks to an abundance of supportive firms specializing in the indie space. 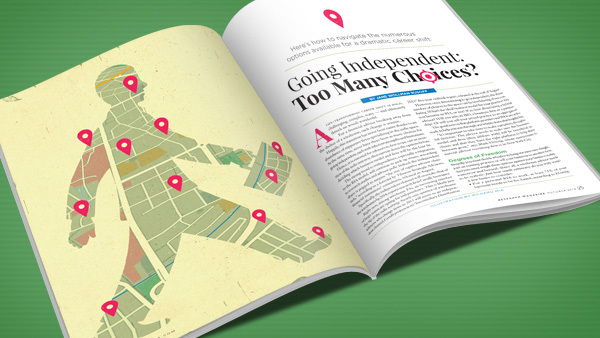 At the same time, never have there been as many choices for going independent, each with inherent strengths and limitations. Hence, it is essential for advisors to first scope out an overview of the indie universe, then narrow down the options before deciding which business model and firm will be the best fit. The strong trend to independence, especially a migration to the RIA model, will continue to pick up steam, according to research studies and advisor polls. Indeed, the independent share is pegged to surpass “the size of captive advisor channels,” according to a forecast by Tiburon Strategic Advisors, financial institutions’ consultants, released in August. Specifically, the independent channel will overtake that of the wirehouses by 2018, reports research firm Cerulli Associates. Right now, among wirehouse FAs, an increasing number of large teams are opting for independence. This is likely just the tip of the indie iceberg: Nearly one-quarter of wirehouse advisors who change firms in 2015 will move to an independent channel, Cerulli projects in its “Intermediary Distribution 2015” five-year outlook report, released at the end of August. However, once determining to go independent, the sheer number of choices in the space can be bewildering, if not confusing. What’s the ideal business model for your practice? Do you become an RIA, or not? If so, how about being a hybrid advisor? Will you join an IBD, a boutique firm or a partnership? Or will you sell your prized practice to an aggregator? The good news is that platform providers and IBDs are at the ready to help you sort through and whittle down that lengthy list. “It’s important to take time to make a prudent, thoughtful decision. The advisor needs to make sure the business model and firm [they affiliate with] will be beneficial to clients and that they have the right platform to help their business grow,” says Mark Elzweig, whose eponymous financial advisor recruiting firm is in New York City. Broadly, you must decide whether to hang out your own shingle, join an existing practice or sell your business to another firm. And you must weigh these options against your business today, tomorrow and beyond. Above all, a wirehouse advisor needs to be realistic: Just how much autonomy do you truly want? For a personal RIA to work, at least 75% of your business needs to be fee-based, according to Elzweig. Hybrid advisors can either have their own RIAs or work under another firm’s corporate RIA; they can also perform commission business through an IBD. A dually registered advisor can conduct both fee-based and commission business, and there is no requirement to be an RIA. While there’s plenty of potential for an independent to boost the bottom line, payouts among firms are similar; and compensation — that is, economics — should be only one of myriad concerns. “Someone who is going independent just for the money tends not to be a good prospective client for the independent channel. It’s a big red flag when the first thing the advisor says to us is: ‘We’re looking to make it an economic decision’,” says Tim Oden, senior managing director-business development with Schwab Advisor Services, the nation’s leading RIA custodian. Still, FAs with ambitions to expand significantly by adding advisors, or by buying other advisors’ practices, should choose a business model that will best fulfill these plans. For example, Steven Dudash, 38, and his team of six left Merrill Lynch in June 2014 with the intention of recruiting advisors nearing retirement age and acquiring their books. Dudash, president of IHT Wealth Management, in Chicago, aims to eventually have under his RIA a few thousand reps coast to coast. Gearing up to go indie, he spoke with multiple firms to understand the differences among business models. Once deciding to go hybrid, he affiliated with LPL Financial. “It ended up that the firm was the right fit for what we were trying to do. LPL let us get to that conclusion ourselves,” Dudash says. Taking a consultative approach with prospective clients, LPL’s “responsibility is to provide the advisor with a comprehensive picture of what it means to move their practice and how they can match up the business model they have today with what they want to build over time,” says Rob Sandrew, senior vice president-business development at LPL, who is based in San Diego. Some independent FAs are motivated to build large practices locally via “tuck-ins”; that is, advisors who join their established RIAs. For instance, consider Scott Highmark, 42, and Larry Shikles, 52, who teamed up originally at Morgan Stanley, and have been partners in Mosaic Family Wealth since February. With a deep commitment to the St. Louis market, the two might tuck in advisors who they determine are the right cultural fit, says Shirl Penney, CEO-founder of Dynasty Financial Partners, Mosaic’s platform provider. After deciding to create a hybrid RIA, Highmark and Shikles, whose group totals seven, interviewed a number of firms across the independent spectrum. They picked Dynasty mainly for its fee-for-service model, in which Mosaic pays the company a percentage of its revenue. “Some firms want to own a piece of you or make you a W-2 employee. We wanted to have our own identity,” Highmark says. Navigating the array of providers and choices demands patience and perseverance. Another possibility is working under a corporate RIA instead of personal registration. As a fee-only independent business owner, Jason Ezzell, 43, founder of Ezzell-Conklin Group, in Folsom, California, is supported by HighTower’s platform and accesses RIA operations through that firm’s national RIA. “We talked to a lot of providers and regionals. With HighTower, we got the feel of the old-school wirehouse but with the flexibility of multi-custodial relationships. They really helped from a client-centric standpoint,” notes Ezzell, formerly with Merrill Lynch and independent since May 2014. HighTower, headquartered in Chicago, was founded in 2007 as an aggregator acquiring practices, or “roll-ups,” but has since expanded into a platform provider offering four different options. One is equity ownership in the firm, in which the FA becomes a HighTower partner and W-2 employee. Other major aggregators include Focus Financial Partners and United Capital. Many FAs take a traditional approach to independence: solo practitioner affiliated with an IBD. Typically, these advisors are dually registered. “All the different types of models were completely overwhelming. I couldn’t figure out what ‘hybrid’ meant,” says Beth Jeter Hrubala, 44, formerly of Morgan Stanley, who a year ago last April launched Jeter Hrubala Wealth Strategies, in Spartanburg, South Carolina, affiliating with Raymond James Financial Services. “I met with a lot of the firms’ recruiters and asked what was important to their company and about other advisors’ transitions. That was the really hard part because you don’t know if what you’re hearing is reality. All the recruiters make it sound good all the time. At Morgan Stanley, there had been a gap between reality and what had been promised,” says the dually registered Jeter Hrubala. Meeting with independence-seeking FAs, Raymond James Financial pledges solid support before, during and after the transition. “We show advisors, especially those coming out of the employee model, that they aren’t going to be in this alone,” says Jodi Perry, regional director of Raymond James Financial Services, in St. Petersburg, Florida. This includes help with arranging for health insurance and retirement plans, plus securing office space. A minority of breakaways know from the get-go which business model they’ll use. When David Weidmayer, 46, decided to transition after more than 20 years as a wirehouse employee — most recently with Wells Fargo Advisors — he elected to start a solo practice affiliated with an IBD. Conducting research to learn which firms independent FAs rated highest, he interviewed only two of these. Largely because it is privately owned and operated, Commonwealth Financial Network was the IBD the advisor selected for Weidmayer Wealth Solutions, which he founded in August 2014, in Indianapolis. “It was important to me that [my BD] had no outside pressure from shareholders or anyone else,” says the dually registered FA. What clinched the deal was Weidmayer and wife Kendra’s visit to Commonwealth headquarters. After meetings, the couple literally stood in a corner and observed folks interacting. “I tried to use a little emotional intelligence to see how it felt in that environment. It felt great,” Weidmayer says. Commonwealth is a boutique IBD with a personal touch offering easy access to its top management. In talking with prospective clients, the firm drills down to the nitty-gritty to help them choose, says Andrew Daniels, managing principal-business development. “We ask advisors how they manage money, charge for services and where they want their practice to be in five or 10 years,” notes Daniels, based in Waltham, Massachusetts, a Boston suburb. Since many breakaways are hazy about what constitutes the hybrid model, Daniels supplies not only clarification but advice on suitability. “In most cases what advisors are really looking for is dual registration. Having your own RIA as a hybrid means you must be the chief compliance officer. But advisors coming from wirehouses don’t want to be in the infrastructure-management business. That’s why dual registration makes more sense,” Daniels says. Commonwealth also offers models in which an FA can either operate under their own registered investment advisory or the BD’s corporate RIA. Exploring the indie space, advisors should be prepared, if not eager, to be interviewed by the firms they’re interviewing. Information they thus provide is crucial to arriving at informed decisions as to business structure and firm. “If an advisor likes all aspects of independence but can’t stand the concept of having an ownership model, it triggers a yellow flag: Are they better served in the environment they’re in versus making the move to independence?” says Schwab’s Oden, in Newport Beach, California. In view of firms’ extensive support and the growing number of breakaway advisors nowadays, shifting to independence is far less intimidating than it was pre-financial crisis. Still, taking plenty of time and effort to make the right pivotal choices is vital to success.